AKA Case Management attended the Nottingham Post Carer of the Year Awards 2017 yesterday for the second year running. The guest list included our EM Case Managers and office staff Donna, Dawn and Beth. As Gilly Crooks was a finalist, she should have been there with us but she was working hard as usual supporting our client Rosie in Spain. To support her (while she watched via live video! ), some of her many fans came along, including her husband Adrian, her daughter (and our support worker) Alex, our client Sam Hindley with mum Julie Hindley and a fellow support worker Chris Adams. We arrived and were greeted by Prosecco and a red carpet, which is always a nice start! We were quickly seated and after a few introductory speeches, lunch was served. Similarly to last year, the food was lovely and as chocolate fiends we definitely appreciated a chocolate brownie for dessert. There was also a Twitter board during dinner, during which Dawn and Beth furiously tweeted to make sure AKA was on the board at all times (competitive natures clearly). 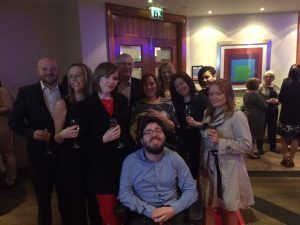 The first award was the one we were most excited to hear the results for… Home Carer of the Year. We videoed the proceedings for Gilly so she could watch over in Spain, and she got a lot of support from the audience when everything she did was read out to them. Unfortunately, she didn’t win, but all the finalists were incredible and we are so proud of her for being a Finalist. Her daughter Alex went up to collect her Finalist certificate on her behalf. As the awards went on, we heard some amazing stories about some incredible people, a lot of whom were extremely humbled by their win. None seemed to understand why they deserved the award, which is the nicest aspect as it shows that their hard work and caring natures come naturally to them. There were a lot of tears on the AKA table, so the tissues we got given at the beginning definitely came in handy. Towards the end, it was time for the category we sponsored: Supporting Independence. Mairi went up to present the award on our behalf, and she perfectly captured why AKA considers supporting independence to be so important. The very deserving Debbie G (from HISC Nottingham) won the award and Mairi had photos with all of the finalists. All in all, a great day was had by all, and it was amazing to see so many hard working carers recognised for the job they do everyday. We can’t wait to attend again next year as a sponsor and just need to decide who we can nominate next year!